This past week, I put a challenge out to my team. Those that completed the challenge will be receiving a February Stamp of the Month card in the mail from me as a business builder tool. This is new paper along with new stamp sets so that will have this card to share with customers. I thought I'd show you the card they will be getting and talk about a little of what it means to be a Close To My Heart and be on my team! What is our mission at Close To My Heart? We show you how to celebrate relationships through discovering your creativity, to preserve and share the moments that matter the most. Do you love to teach others and share the art of paper crafting? This might be just the opportunity for you! Let me tell you a little about why I love being a Close To My Heart consultant. There is a huge community of paper crafting paper crafting buddies that are willing to share ideas! I LOVE my team! The Rose Blossoms are about the most creative and friendliest team in Close To My Heart. They support, encourage, and help each other through our private Facebook group on a regular basis. I absolutely LOVE to teach others the art of paper crafting! Close To My Heart offers a generous commission along with monthly product rewards according to sales. I am able to order new product one month before it comes out. I LOVE that! Close To My Heart offers loads of training and support through an online academy, videos, and MP3 listening library. I can find an answer and support for business, creative, and personal development. It's awesome! Regional Celebrations (like the one I attended in Detroit in October) and Yearly Conventions. This year I'll be heading to Dallas in July! 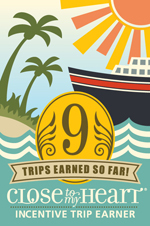 Incentive Trips! Had it not been for Close To My Heart, I would not have seen Italy and fulfilled one of my dreams. We were so spoiled on that cruise! And finally - I am at home, being my own boss, running my business the way that I choose! Would you like to see the NEW Consultant Kit? It's amazing and jam-packed with almost $300 worth of product! These are wonderful business and creative products to launch your business in your way. Whether you want to join the Close To My Heart family to get product at discount (low quarterly minimums make this easy!) or earn a little extra to pay a bill or two (or pay for your paper crafting supplies), or if you want to be your own boss and run a business - it's all possible with Close To My Heart. There is a place for you! Please contact me at (763) 227-0583 or girlygirlrose43@msn.com with any questions you might have. If you are ready to take the plunge, you can visit my website and the online application HERE. I'd love to call you a Rose Blossom!! And then, you might be the one receiving a business builder card in the mail!! Oh! I can't wait to receive my card! I'm so fortunate to be working with incredible product and double-darn lucky to be on your team! What a beautiful card, Brenda. Your team members are so lucky to have you as their upline. You are so good! If I ever decide to sign on...I would want to be a Rose Blossom! Maybe when I retire from my day job. cute card btw. It sure is a pretty card that they will be receiving.